The history and politics of Jordan have been intricately linked to those of its neighbour, Iraq, and the car bomb outside the Jordanian embassy in Baghdad indicates that this is still the case. "As always, Jordan occupies an uneasy middle ground," said James Reeve, a Middle East analyst at the Economist Intelligence Unit in London. He told BBC News Online: "King Abdullah has been hedging his bets over Iraq. Jordan is financially and militarily dependent on the US, so it can't stray too far from the American line. "But the King's domestic audience is fiercely critical of the American occupation and this cannot be ignored." Jordan's manoeuvring through the diplomatic minefields means therefore that it is a potential target for factions opposed to the US and British occupation. Like other members of the Arab League, Jordan has not recognised the new Iraqi Governing Council and will not send troops to a multinational force, but nor has it condemned outright the process of establishing a new government. Jordan's Foreign Minister Marwan al-Mu'ashir said in Cairo this week that recognising the Council was "not a possibility" but that it was "a step on the right track" towards a legitimately elected Iraqi Government. King Abdullah adopted a more nuanced position than had his father, King Hussein, who more openly sided with Iraq during the first Gulf War of 1991. It took King Hussein several years to repair his relations with the United States. Jordan spoke out against the invasion of Iraq this year. But it also secretly allowed US special forces access to its bases from which to operate in Western Iraq, securing the so-called Scud box, the vast area of desert used by Iraq to fire missiles at Israel during the war of 1991. One of the American helicopters was seen by a foreign television crew. "King Abdullah with his British military training and American university education has his problems in the region," said James Reeve. "But he is also seen by young Jordanians as quite progressive. Politically it is very difficult for the King." Another example of Jordanian political care was shown recently when it emerged that two of Saddam Hussein's daughters Raghdad and Rana and their nine children had been given refuge there. In an interview, Raghdad Hussein spoke loyally about their father. 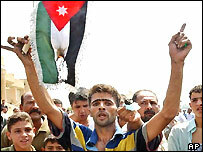 By giving asylum to members of the Saddam Hussein clan, Jordan was signalling its sensitivity towards the old regime but by confining that asylum to women and children, it was showing the limits of its hospitality. This ambiguous approach goes back years. Jordan's balancing act makes enemies as well as friends. There have been suggestions that it angered a lot of people in Iraq by helping Saddam's relatives. Jordan also has an ongoing row with one of the members of the Governing Council Ahmed Chalabi, who was sentenced in his absence on financial charges. Jordan quietly did well out of Saddam Hussein's years in power. With his own outlets to the sea blocked by the Iran-Iraq war, many of his imports came through the Jordanian port of Aqaba. 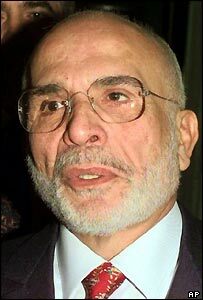 King Hussein was prudent in his dealings with the Iraqi dictator, but the King was always mindful of the need to balance this by keeping in with the West, difficult though that was at times. The delicacy of this type of diplomacy is highlighted by the fact that Jordan and Iraq were both set up by the British and both were governed by members of the same Hashemite royal family installed by Britain. And yet, Jordan had to keep in with anti-monarchists in Iraq despite the assassination of the Iraqi King Faisal in a military coup in 1958. It would be in Jordan's interests to see a moderate government installed in Baghdad. That would remove the need for it to constantly try to occupy the uneasy middle ground. But that point has not yet been reached.